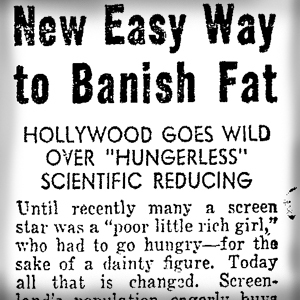 While researching a project completely unrelated to Southern California's well of weight loss secrets, I came across a newspaper advertisement — pictured at right — for Hollywood Bread, and, as summer is the get-skinny season, it seemed as good a reason as any to share it here (view the full ad at this link). You don't have to be a Los Angeleno to greet all diet claims with immediate suspicion, if not full-on Fran-Drescheresque laughter, but given this Hollywood Bread advertisement was published in the Oakland Tribune nearly 70 years ago, it not only amused me, but deepened my understanding of human gullibility and the pitfalls of misfiling long-term lessons in the short-term memory bin of our brains. As Pres. George W. Bush once said (on camera): "fool me once, shame on -- shame on you. Fool me -- you can't get fooled again." Until recently many a screen star was a "poor little rich girl," who had to go hungry — for the sake of a dainty figure. Today all that is changed. Screenland's population eagerly buys Hollywood Bread, the delicious filling new loaf that knocks Old Man Hunger for a loop, yet contains so few calories that it is a cinch to make room in a rigid diet for a couple of slices at every meal. One of the reasons why Hollywood Bread is so good, and so good for you is that it contains the essence of eight different vegetables including celery, lettuce, spinach, carrots, pumpkin, cabbage, parsley and kelp. These give the most marvelous flavor to toast and to sandwiches of all sorts. Toasts evenly, too. I'm acquainted with "Old Man Hunger," but I've never been to "Screenland."